The following crime prevention tips were provided by the Kent Police Department. Adequately light all exterior sides of your business, including alley ways and parking lots, using vandal-resistant fixtures. As most store burglaries occur at night when it’s dark, lighting serves as one of the most important deterrents. Install an alarm system and check it regularly for failure. 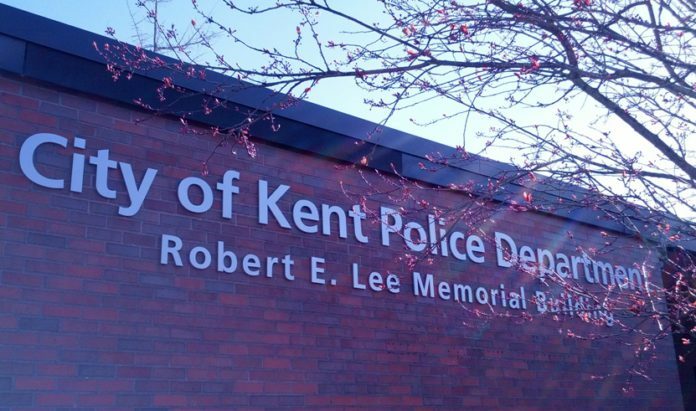 Contact Kent PD for assistance in selecting an alarm system. Post notice you have an active system in place. Reinforce doors with long screws or bolts on heavy-duty strike plates, pop-out-proof hinges, or hole/nail combo at top and bottom. Replace all hollow-core exterior doors. Install deadbolt locks on all outside doors and double cylinder deadbolts on doors with glass panels. Check the locks are properly installed and used at ALL times. Issue as few keys as possible and change the locks if keys are lost or not returned by a former employee. Don’t tag keys with the name of your business. Don’t provide concealment or climbing platforms for the burglar. Clear and maintain all debris, weeds, and shrubbery away from windows and doors. Lock up ladders and all tools that could make a burglar’s job easier. Protect windows and glass doors with transparent window security film, security glazing, or roll-down security panels; or install burglar resistant glass. Use bars or grating on rear and side windows. Consult with your fire department on fire safety ordinances for doors and windows. Keep a minimum of cash on the premises. Post signs that say “No cash kept on premise”. Consider installing a video camera system. If you already have one, ensure it is working properly, always recording, and provides clear images of what is filmed. Post notice you have an active system in place. Move valuable merchandise and business equipment such as computers away from the windows or doors to prevent smash and grab thefts. Make it difficult to steal merchandise…bolt racks down, alternate the direction of hangers on the rack, tie appliance cords together, chain bicycles, lock small valuables in cabinets and show cases. Arrange window displays so that passersby and police can see into the store. Anchor your safe to the floor in a well-lit, highly visible location. Keep all valuable documents and items, including company vehicle keys in safe. Always leave on an interior light that is visible from the street. If for any reason it is off, the darkened store will arouse suspicion. Don’t lock a burglar inside when you leave. Inspect all closets, bathrooms, and other hiding places before closing. For personal safety, try to have two people present at both opening and closing.